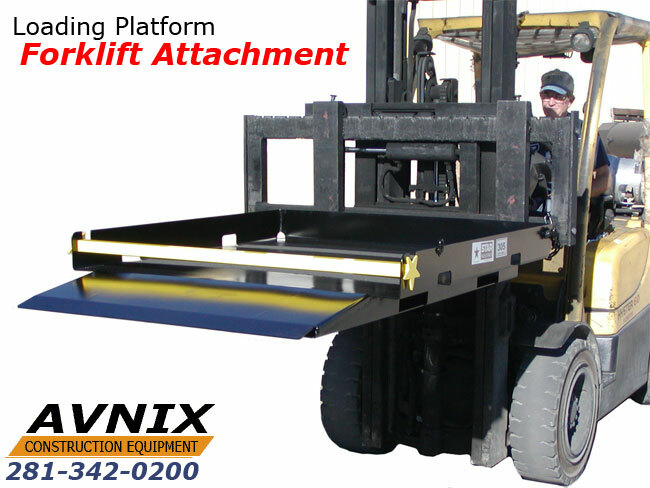 New Forklift “Safety Loading Platform” Similar to our popular Load-N-Tow But simpler in design and at a lower price everyone can justify Slide It on the forks and one man loads and unloads heavy awkward rental equipment quickly and safely. Loading Platform Forklift Attachment Slide it on the fork and one man loads and unloads heavy unwieldy commercial equipment quickly and safely, plus the loading platform attachment shortens client wait time, cuts employment costs, prevents back injuries, and reduces damage to equipment. Loading Platform features fixed 15″ ramp for easy loading, end and side fork pockets- pick up platform from either direction, slots for standard 2″ straps to secure load when needed, straightforward retaining bar keeps load from rolling or sliding off, large 48″ x 48″ deck handles most all small to medium equipment and rugged heavy duty construction ensures for a long life..
Specs: Accepts Forks Up To 2.75″ thick x 7″ wide x 48″ long, Overall Dimensions 50″ wide x 65″ long x 8.5″ high with 36″ safety chain and hook secures platform to forklift. Load Cap 1000 lbs, and Empty Wt. 305 lbs. Accepts forks up to 2.75″ thick x 7″ wide x 48″ long. Overall Dimensions – 50″ wide x 65″ long x 8.5″ high. 36″ Safety Chain and Hook secures platform to forklift. Load Capacity – 1,000 lbs. Empty Weight – 305 lbs. End Fork Pocket Size: 48″ long x 7⅝”x 2⅞” I.D. Side Fork Pocket Size: 8″ x 3″ I.D.